As a customer of a weekly Community Supported Agriculture (CSA) delivery of locally grown fruits and vegetables and a regular visitor to restaurants featuring seasonal offerings from area farms, I consider myself part of the farm-to-fork movement. Of course, I’m much more familiar with the fork end of the equation. So I decided a few weeks ago to learn more about the farmers who are adopting sustainable agriculture practices with locally-adapted varieties that have the potential to offer more nutritious, more flavorful produce. I started with a visit with Jordan Tony and Silvan Goddin, the founders of Red Wolf Organics in Orange County. 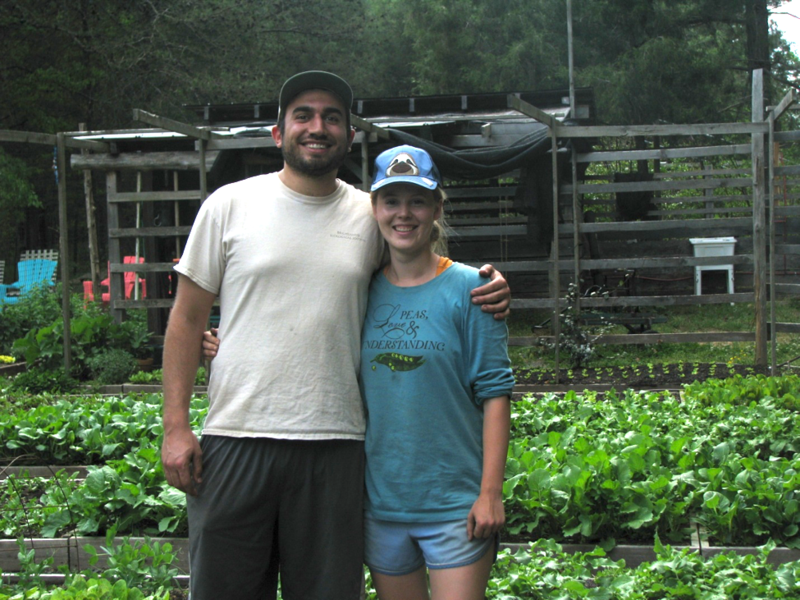 When Jordan completed his farming apprenticeship at the Center for Environmental Farming Systems (CEFS) – a partnership of North Carolina State University, North Carolina Agricultural and Technical State University, and the North Carolina Department of Agriculture and Consumer Services – in 2014, the couple decided to take advantage of Jordan’s CEFS training and Silvan’s previous farming experience to start their own farm. First, they needed some land. Red Wolf Organics supplies produce for weekly CSA deliveries that customers purchase for $20 a week. Silvan also staffs a stall on Tuesdays at the Fearrington Farmers Market, which has provided valuable market research. As they gain more experience as farmers – and marketers – you might expect that Red Wolf Organics would start planning for expansion and scaling up. Nope. Although they operate on a thin profit margin, Red Wolf Organics has managed to donate 10 percent of its profits to charity at the end of every season. “We plan on donating to environmental causes in the future, but lately we’ve been donating to Syrian refugee relief, given current circumstances,” said Jordan. As Jordan and I talked, Silvan watered a range of crops in various stages of ripening. Red Wolf Organics specializes in growing heirloom varieties of the kinds of vegetables North Carolinians find interesting or unique. 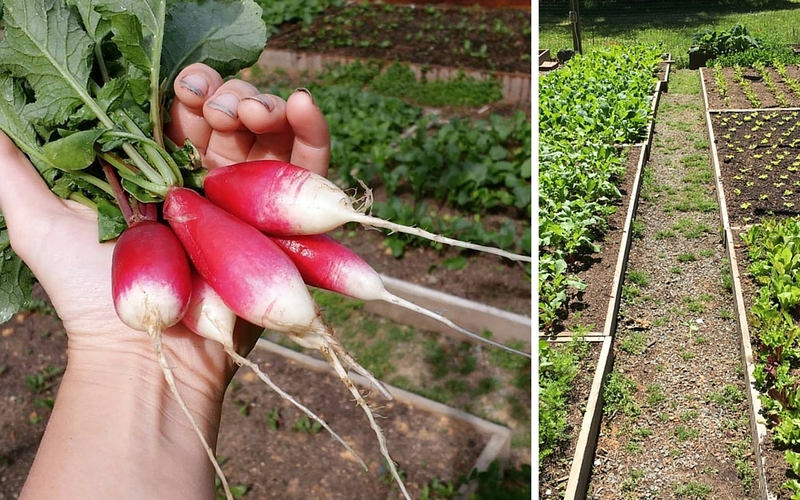 During my visit to the farm, I saw several kinds of radishes – I didn’t even know there was more than one kind – snap peas, and different greens sprouting up. 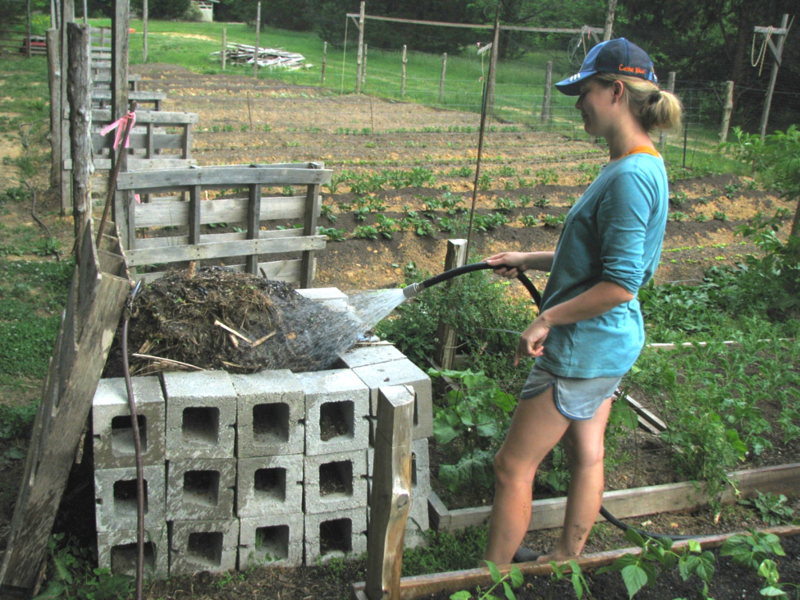 But when I saw Silvan watering what looked like a pile of rotting weeds, I had to find out just what the heck she was doing. Smaller organic farming operations like Red Wolf are fueling North Carolina’s interest in the farm-to-fork food economy. Blue Cross and Blue Shield of North Carolina (BCBSNC) is a strong supporter of the movement, sponsoring community gardens in nearly every county of the state. From June 3-5, BCBSNC will sponsor the 2016 Farm to Fork Weekend, which includes a sustainable supper and square dance at the Haw River Ballroom in Saxapahaw, a more formal dinner with chefs Sam Kass and Andrea Reusing at the Durham Hotel, and a farm-to-fork picnic at W.C. Breeze Family Farm in Hurdle Mills. Join us for a celebration of local foods from local farms. And if you get the chance, stop by the Fearrington Farmers Market on a Tuesday to say hello to Silvan at the Red Wolf Organics stall.